The Etivaz is essentially as Gruyère was 100 years ago. It is cooked over old-style, open wood fires only when the cows are doing their summer grazing in Alpine pastures on sea levels above 1,600m. It has a pure, slightly smoky taste with hints of hazelnut. 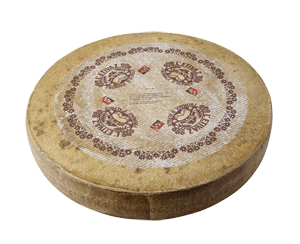 The Etivaz is made essentially as Gruyère was 100 years ago. It is made only when the cows are doing their summer grazing in Alpine pastures. It must be made in traditional copper cauldrons, and only over old-style, open wood fires. The resulting cheese is a bit creamier and less sharp than Antique Gruyère, yet smooth and flavorful. L’Etivaz has a firm texture with a fruity, slightly nutty flavor, which varies depending on the soil of the different pastures. It is yellow ivory in color and slightly sticky due to its saltiness. It is aged for 5 to 13 months before it is eaten. L’Etivaz is a hamlet in the southwestern Swiss Alps, just under the Col des Mosses in the canton of Vaud. It has about 150 inhabitants. The cheese is made in the communes of Château-d’Œx, Rougemont, Rossinière, Ormont-Dessous, Ormont-Dessus, Leysin, Corbeyrier, Villeneuve, Ollon and Bex. In the 1930s, a group of 76 Gruyère producing families felt that government regulations were allowing cheesemakers to compromise the qualities that made good Gruyère so special. 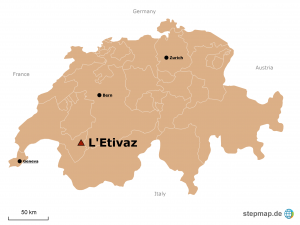 They withdrew from the government’s Gruyère program, and “created” their own cheese – L’Etivaz – named for the village around which they all lived. They founded a cooperative in 1932, and the first cheese cellars were built in 1934.